DECEMBER’s freezing temperatures do not seem to alter the plans of hordes of people and schoolchildren lining up before well-maintained museums in Zurich. One can’t help wondering that for the people of Zurich, building museums must be as routine an activity as round-the-clock road-digging is for Bangaloreans! A Pro Helvetia, the Swiss Art Council, sponsored trip that began and ended with Swiss precision (never mind the jetlag-sponsored migraine attacks!) revealed how truly global the city of Zurich is. But first, a plunge into the supersoft bed at Hotel Sofitel, just to have everything fall in place. The Grossmunster Church, standing tall amidst a cluster of buildings as Lake Zurich flows by ever so quietly, greets the visitor. Even a thick screen of fog fails to mask the splendour of this 12th century cathedral that still serves as the landmark of Zurich. Forever buzzing with activity, Kunsthaus hosts at least 10 permanent exhibitions every year. Its walls are adorned with murals, and the space dotted with sculptures mutely hinting at the magnificent times gone by. You have Vincent Van Gogh, Rodin, Chagall, Monet, Pablo Picasso, the local favourite Ferdinand Hodler(1853-1918) and many other geniuses. One wonders how nettling it must have been for the museum authorities to allocate space for each master when every stroke of genius, and every piece of art is sublime! Yet, what attracted my attention is Hodler’s beautiful landscapes perhaps because he is little-known outside the art world of Switzerland. It was price that Hodler paid for speaking out against Germany during the First World War. All his works were removed from the museums and Hodler remained isolated, and his art, unappreciated. Fortunately, no war lasts longer than the art that speaks for peace. Hodler’s paintings are now sold for millions of francs, thanks to the painstaking work that has gone into preserving the treasure by museums like Kunsthaus which owns one of the largest collections of Hodler’s works. Mountains, peaks, valleys, rivers, streams, trees, leaves, stones—in short, nature in all its vibrancy—come alive in his landscapes. Unless you are ready to stop by the painting to look at each stroke, each motif, you might mistake it for a super-sized photograph. 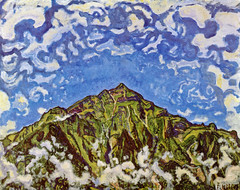 Such is the artistic precision of Hodler, one who was ever so faithful to nature. However, you wouldn’t do justice to Kunsthaus unless your itinerary allows you to spend two to three days here. (Pro Helvetia, the Swiss Art Council sponsored this trip a few years ago). This entry was posted in Stepping out and tagged Alberto Giacometti, Ferdinand Hodler, Museum, Pablo Picasso, Pro Helvetia, Switzerland, Vincent Van Gogh, Zurich. Bookmark the permalink.